Bastion will be the first Overwatch hero to get the LEGO treatment. 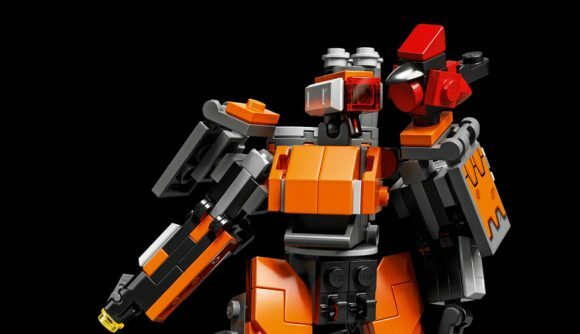 Blizzard and LEGO have been teasing a crossover since August, but Bastion’s set – which has just appeared on the Blizzard Gear Store – is the first to be made available for fans. A recent teaser showed off a CGI minifigure of another hero, Tracer, but LEGO Bastion is far more ambitious than that. It’s a 182-piece set that casts the robotic hero in his orange Omnic Crisis skin, and allows him to move at both the waist and in the ‘shoulders’. There’s even a small working ‘gun’ in Bastion’s right arm, allowing him to fire bricks a short distance. Sadly, LEGO Bastion only gomes in his mobile Recon mode, and there’s no official way to convert him into either his Sentry or Tank modes, but I imagine there are some master builders out there who’ll figure it out relatively soon. Importantly, however, Bastion does come with a little LEGO version of Ganymede, his charming bird companion, which is very cute. LEGO Bastion is a Blizzard exclusive toy, so you’ll only be able to buy it on the Blizzard Gear Store, where it’s going for $25 (£22.50). It’s available now, but only in limited quantities, so you might want to move quickly. That said, this is only the first toy in the partnership, and with BlizzCon just around the corner, I’m expecting a few more sets to be announced relatively soon. Elsewhere in the hero shooter, Overwatch’s Halloween Terror event is now live, bringing a host of spooky skins to the game. The Overwatch League Season 2 format has also been announced, which offers the 20 teams competing a little more time between matches during some weeks.